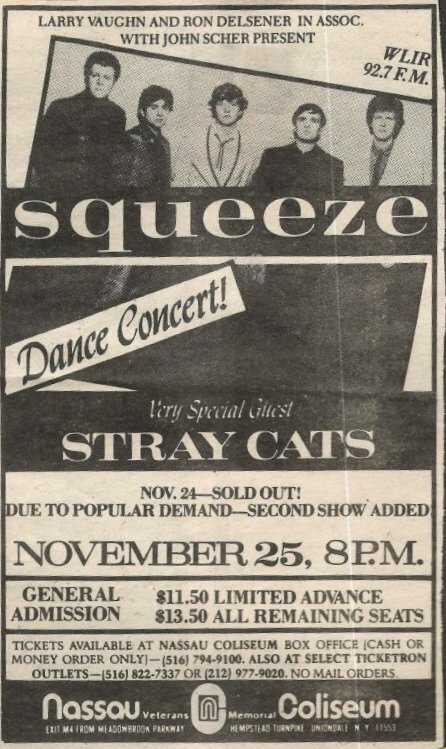 9 Responses to "Squeeze – 25 November 1982 – live at Nassau Coliseum Uniondale NY"
Happy to say I was at this show as well as the one the night before, which included REM and the English Beat as opening acts. What a great memory of my “first real show” as a lad. Sounds a great night Alec – I love the way it says ‘Dance Concert’ on the advert – so many venues wanted to tie you to a chair! It was a general admission show in a hockey arena – with an open floor (no chairs) – I guess they viewed that as a dance floor. What a memorable night. Thanks for bringing back the memories. Now if I can only convince the boys to have a gig a little closer to Atlanta….. I was at this show as well. From what I remember it was Thanksgiving night. I was 17 and had a rough time convincing my parents that I just *had* to be at this concert. I won :-). It was a general admission show for the entire arena. I was the only one among my friends that was willing to, ahem, squeeze up to the front of the stage for a good view. The Stray Cats were from Long Island, and very popular in the area. However when they finished their set a lot of people left the floor and I pushed my way to the front of the stage. What an amazing show! People were throwing toothpaste and toothbrushes on stage during Tempted. It was my first Squeeze show and I was totally hooked. Of course they broke up right after this tour which was heart-breaking at the time… I’ve been to countless shows since then but you always remember your first, lol. Thanks for the memories Michael – I love the bit about the toothbrushes! I was at this show! Brian Setzer fell off the stage and injured his hand. Everyone was having a real good time that night! Sounds great – apart from the injury! I saw the Nov 24th show, it was incredible!! I was on the floor fairly close to the front w/some friends. We had the toothpaste, toothbrush, PJ’s, etc. all thrown at Squeeze during “Tempted” too, loved it!! I was over the top about the Stray Cats at the time, Brian Setzer is quite the guitarist! !